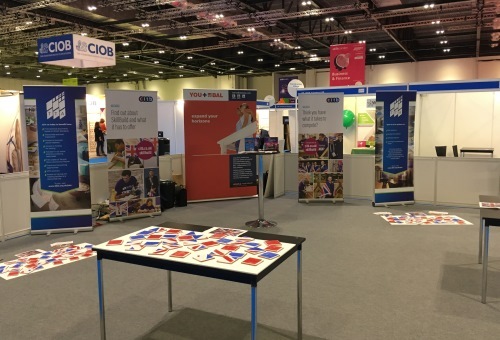 BAL have teamed up with CITB (Construction Industry Training Body) and The Tile Association to demonstrate the benefits of a career in wall and floor tiling and other trades at Skills London – the UK’s biggest jobs and career events for 15-24-year olds. Dave Rowley, BAL training manager, was there in his role as lead judge of wall and floor tiling at SkillBuild – the largest multi-trade competition in the UK for construction trainees and apprentices. BAL is a long-time sponsor of SkillBuild, providing tiling materials for regional and national competitions. On the SkillBuild stand, visitors could learn how to get into construction as well as finding out about TTA and BAL training courses. They could also have a go at a fun Union flag mural game. Dave said: “It was a fantastic opportunity to speak to college students and young people about wall and floor tiling and what a great career it can provide.